Eczema is different for everyone. Some of us get it as a child and never have to deal with it again. Others are living with recurring eczema, where certain itchy patches on our bodies just won’t go away no matter what we do. Many of us belong to eczema-prone families while others of us have sensitive skin that reacts severely to contact with irritants. Whether your eczema is genetic or triggered, recurring or static, you know how hard it is to resist scratching those angry, red areas. You also know that most products on the market are formulated for people with healthy skin and are more than likely too harsh for your sensitive skin. To help you craft a regimen that won’t irritate your skin even further, we’ve rounded up a few of our favorite eczema skin care essentials. Incorporate products like these into your skin care routine to put yourself on the fast track to healing. No matter where your eczema is on your body, you need a cleanser that will effectively clean your skin without drying you out. 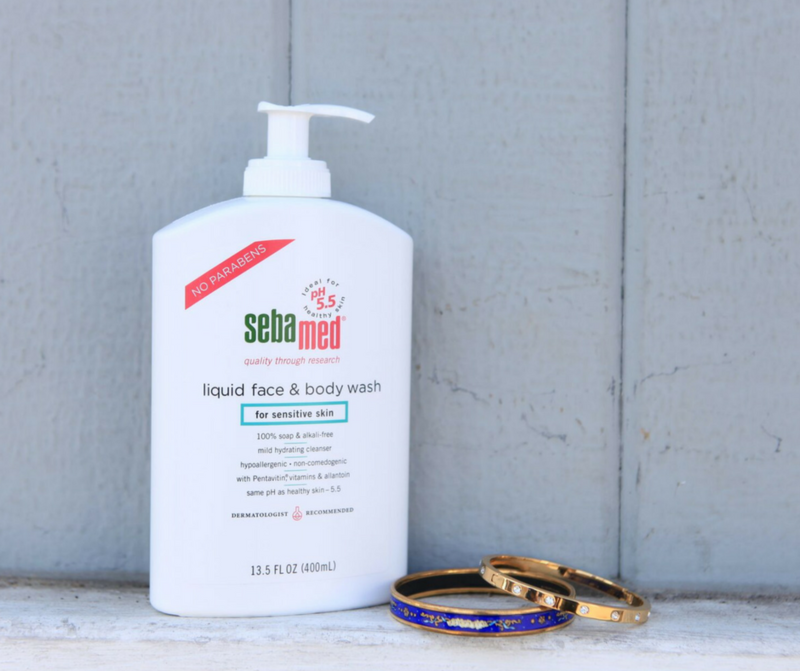 Sebamed’s Liquid Face and Body Wash is gentle enough to be used on the most sensitive skin. Lather it up in your hands and massage into your skin. Rinse off with lukewarm water, pat to dry, and enjoy the fact that you only need one product for both your face and your body. Because allowing your skin to lose moisture after your shower makes your eczema worse, it’s absolutely essential to apply a moisturizer as soon as you pat your skin dry. We like the Original Hand and Body Cream from Beecology. This product gives your skin the hydration it needs without feeling greasy or sticky. Plus, it’s fragrance free! When moisturizing, never forget your face! Try the Moisturizing Face Cream by Sebamed for its light texture and lightning-fast absorption. It also builds up your skin barrier and protects you against harmful pollutants in the air. Yes, you should still exfoliate even if you have sensitive skin. The dryness that comes along with eczema can cause dead cells to accumulate on the surface of the skin. Gently (keyword: gently!) removing these and other pollutants that collect on the epidermis can help you restore your skin’s vitality. Once a week, apply your usual body wash to a soft loofah or sponge and lightly scrub your skin. Be sure to follow this up with moisturizer. This is the product to break out when the itching gets unbearable. A gentle ointment helps your skin retain moisture by acting as a sort of sealant while combating the dryness and itching that comes along with eczema. We know it’s hard not to scratch, but let the ointment do the work for you and say goodbye to those itchy patches. Ready to heal your eczema once and for all? Sebamed offers a wide range of products that you can easily add to your skin care routine. These eczema skin care essentials strengthen your skin barrier by promoting a healthy skin pH of 5.5 with every use. You’ll notice the difference in no time at all!